Tomorrow my baby turns 4. Hard to believe. 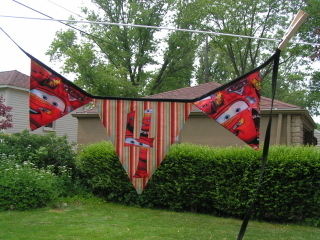 I had this bunting idea in mind for a while and, as usual, procrastinated until the very end to make it. I was inspired by Miss Woolly and bought the bunting pattern from her Etsy shop. I searched for fabric online and really fell in love with Moda's Peas and Carrots collection. I was lucky to find the fabric at my local quilt shop and right next to it was this great alphabet fabric. 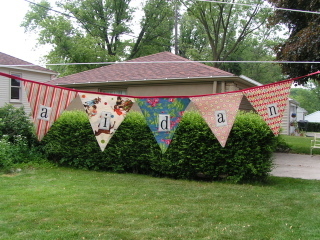 I picked some up and put Aidan's name on the bunting. I used wonder under to attach the letters to the birthday banner and the number "4" to the year banner. I sewed around the edges. 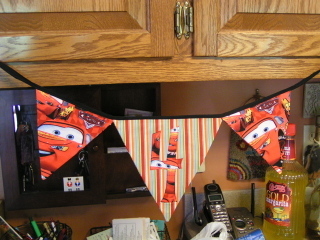 On the birthday banner, I also turned in the edges before attaching Wonder Under and sewing but didn't do so with the number banner. I added a mid-weight interfacing between the layers of each flag. I used pre-made bias binding rather than making my own. I changed the size of the flags on the year banner. 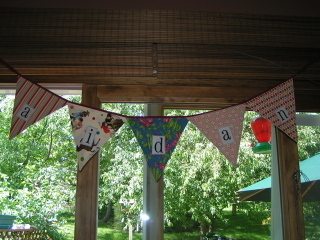 Another shot of the birthday bunting at the party. Here's the "4" bunting again. No, we did not serve Aidan any margaritas. Oh! i love the use of letters. That gives me ideas about all kinds of appliques. It would be great to use scraps for letters. I love the color of your furniture-just like my couch on my porch! Our siamese was really light brown for the first couple of years we had him but he darkened up after that. He's 11 now. Thanks for visiting my blog. Ooh - I never saw Katie Jumprope. Cute! Go for it! those are so wonderful! What a great idea too- re-useable and much nicer than store bought plastic.